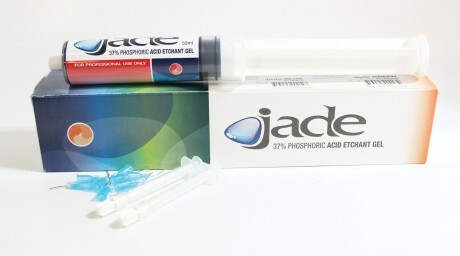 • Jade is a 37% thixotropic phosphoric, non-slump acid gel for enamel and dentin. • Jade is for those clinicians who prefer a creamy gel that flows into dentin and enamel, but does not run. • Jade stays where is placed and does not run onto soft tissue. • Jade washes off completely and easily and does not stain. • Jade has a dark blue color that allows high visibility for precise selective placement. It is also available in a lighter green. • Jade creates micropores in the enamel surface and removes the smear layer to unblock dentinal tubules.